Holy Eucharist Parish in Winnipeg's old East Kildonan district is celebrating their first 100 years this year. They have planned a few major centenary events throughout the year (starting last year in fact), but they are also trying to make every regular event special by marking it with some "100-year-anniversary" specialness. 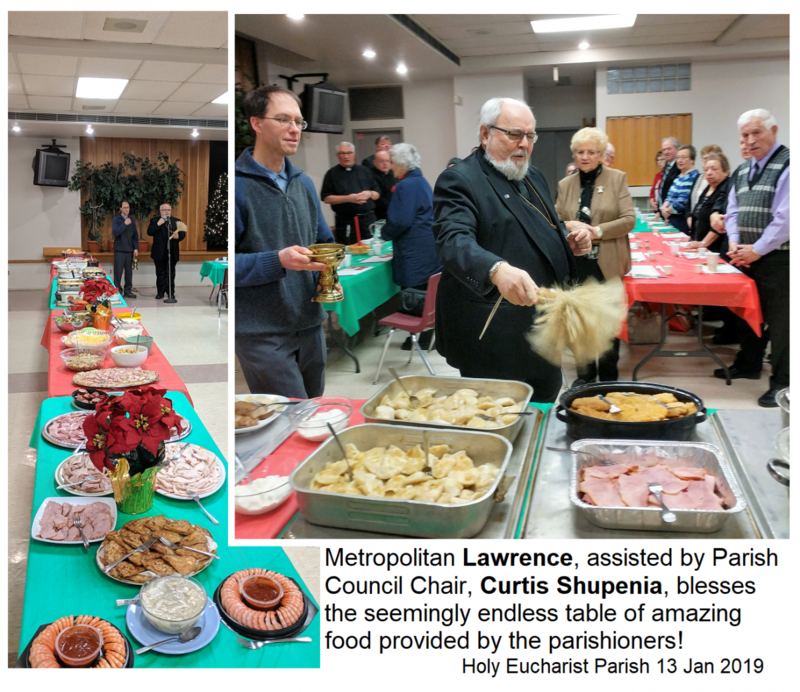 This year, for their very popular annual Christmas and New Year potluck dinner, the parish was blessed by a visit by Metropolitan Lawrence Huculak. He was the main celebrant at the Sunday After Theophany Divine Liturgy at which he preached a very appropriate homily (Matthew 4:12-17) in which he explained that each and every member of the Church is blessed with special and unique gifts and talents. He encouraged everyone to ask themselves how they discern those talents and how they can put them at the service of Christ's Church on a universal level, but especially at the local level - in their own parish. 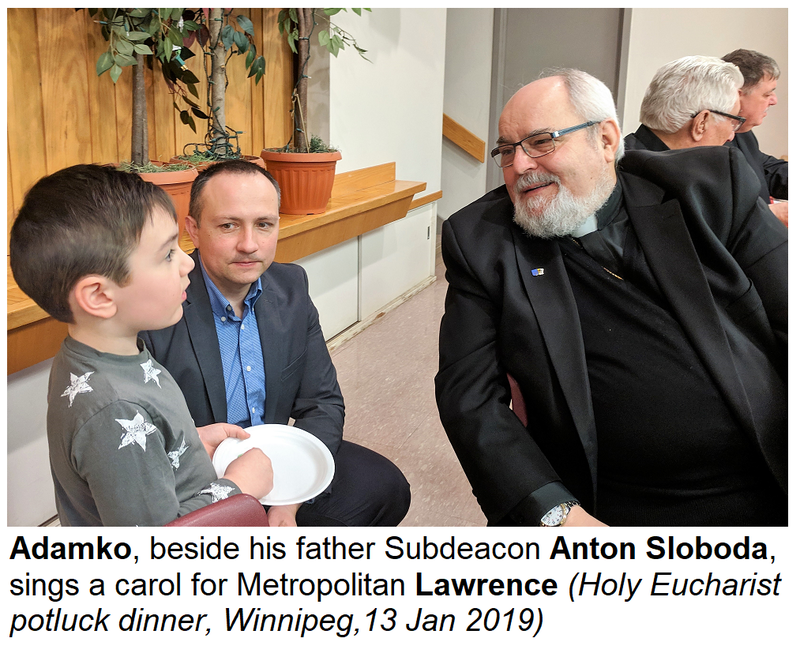 This was an excellent message as Holy Eucharist Parish - like most parishes across Manitoba - will soon be holding its annual general parish meeting at which a new parish council and new office-holders are elected. Assisting at the Divine Liturgy, besides parish priest Fr. Michael Kwiatkowski, were Fr. Djura Maljik, Fr. 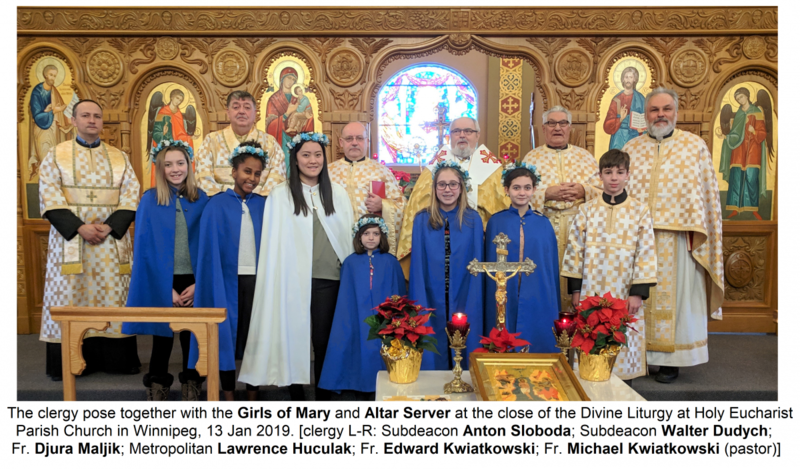 Edward Kwiatkowski, Subdeacons Anton Sloboda and Walter Dudych as well as representatives of the Girls of Mary and Altar Servers. 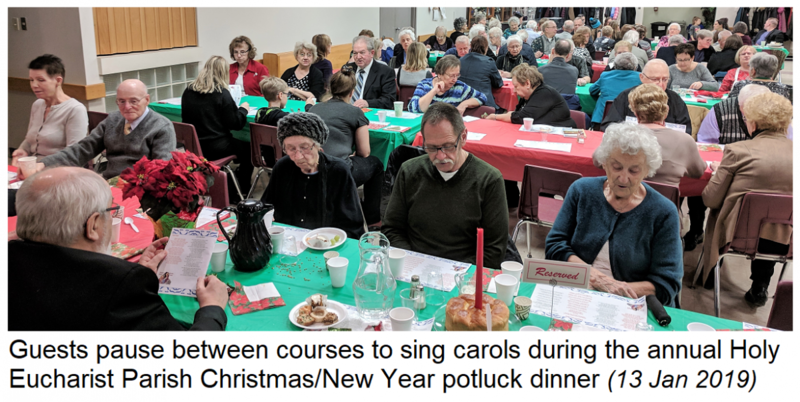 Cantor David Hrehirchuk led the great group of singers and Lydia Firman sang the tropars, while Subdeacon Walter sang the Epistle (Ephesians 4:7-13). After the "многолітсвіє" (the singing of numerous Mnohaya litas - God grant you many years!) everyone was invited down to the hall on the lower level to a grand buffet banquet. There was so much food and a variety of just about everything. Meats, salads, holubtsi, varenyky, breads and sauces and garnishes and then cakes and pastries beyond description. It was all brought by many different parishioners. His Grace, Metropolitan blessed the food - and the whole gathering - with the recently blessed Jordan holy water. 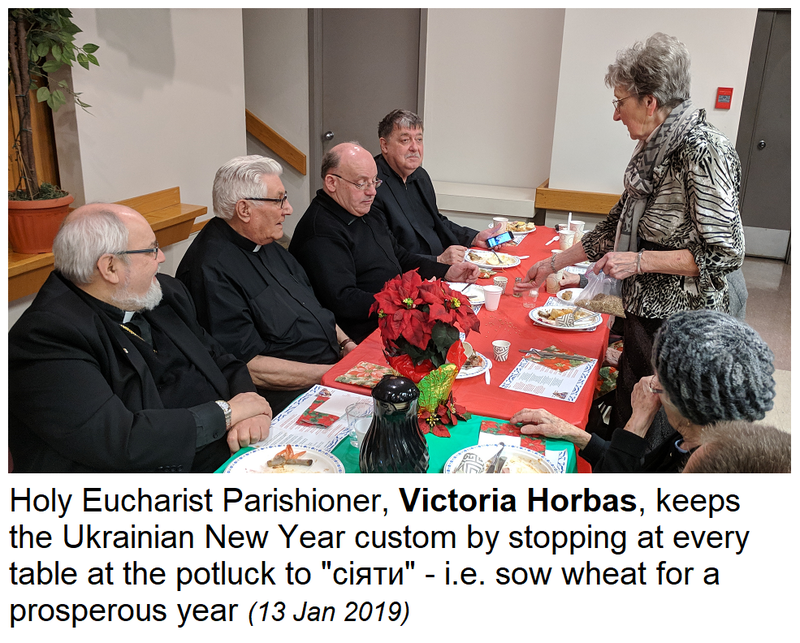 Fr Michael, as parish priest, visited every table with honey-soaked bread, wishing everyone a blessed and successful new year according to God's Will. Some highlights at the dinner were the singing of carols.... Victoria Horbas "sowing" wheat of plenty according to the ancient Ukrainian tradition wishing everyone a prosperous new year (it was, after all, New Year's Eve according to the Julian calendar).... Subdeacon Anton Sloboda's son Adamko taking the microphone and boldly leading the gathering in a carol "Бог ся рождає!".... Shirly Skochylas presenting the Metropolitan with a copy of the new parish 100th anniversary cookbook. As most people present planned also to attend the major Festival of Carols in the early afternoon at the Seven Oaks Performing Arts Centre, they wound up the dinner with a heartfelt "Нова радість стала" (A new hope has arisen!) and asked the Metropolitan to give them a new year blessing for the parish and all their family members and friends.